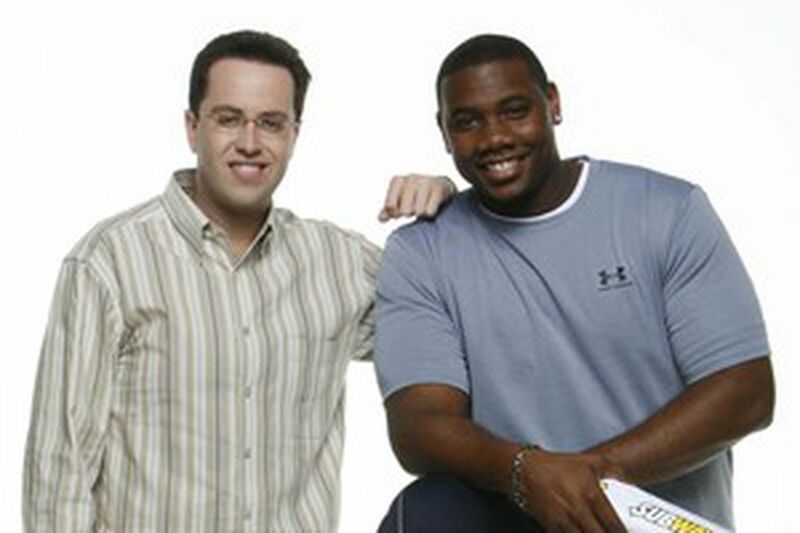 Ryan Howard is the latest pro athlete to sell sandwiches with Jared Fogle. JARED FOGLE is a celebrity in his own right as the longtime pitchman for Subway. But the skinny on Fogle is that the current campaign teaming him with athletes, including Phillies first baseman Ryan Howard, has been an absolute blast. "It's been probably the most fun I've had doing any of the commercials," said Fogle, a professed "huge sports fan" whose back-and-forth with the 2006 National League MVP airs for the first time tomorrow during the baseball games on Fox. Locally, viewers will see the commercial during the Red Sox-Yankees game, which airs at 3:30 p.m. on Channel 29. "The chance to work with these guys has been pretty awesome," Fogle said. Howard and Fogle shot their ad in a studio in Queens, N.Y., in late January, shooting for more than 3 1/2 hours for the 30-second spot. Tony Pace, a Subway marketing exec, said that's typical. "You spend time trying to get exactly what you scripted, but then as you see what somebody like Ryan's comfortable saying and what's working between Jared and Ryan, you go for that," said Pace, adding that Howard exceeded all their expectations. "Our understanding was that he hadn't done much of this kind of thing before, but he was outstanding. Very genuine." Like several of the other ads Fogle does with athletes, he and Howard stand beside each other in front of a table laden with a couple of Subway subs and one of the competition's sandwiches. Howard looks like a natural, shooting his fingers at the camera as Fogle introduces him, then at one point feigning a swing as he says that all the meat in the sub "fills me up, so I can hit the long ball." The ad wraps with Howard flipping the ball underhanded to Fogle, then sheepishly grinning and saying, "That was a terrible toss." Chad Caufield, managing director for the Boston ad agency MMB, said it was the first time a "prop" has found its way into one of these spots, and he credited Howard for it. "It was not in the script, but, quite honestly, I was asking Ryan to sign some balls for various Subway executives," Caufield said. "He grabbed a ball and, in the course of talking, was flipping it back and forth, and it became readily apparent that he was a lot more comfortable when he was working with his hands, particularly a baseball. So we kept it in there." It's not the first TV spot for Howard, who appeared on the NFL Network in February in a Super Bowl Sunday commercial. He termed this experience "cool." "It wasn't anything crazy or out of the ordinary. It was just fun to be out there and get that experience," he said. Obviously, at age 27 and coming off a home-run title and MVP season, he will have more chances to pitch products. As Pace said: "He's one of those guys who's very young, but clearly on a great trajectory. One of the words we often associate with the Subway brand is 'current.' We don't always 100 percent succeed with that, but Ryan is right there in terms of being current." And, for Fogle, the perfect partner. Daily News sports writer Steve King contributed to this report.